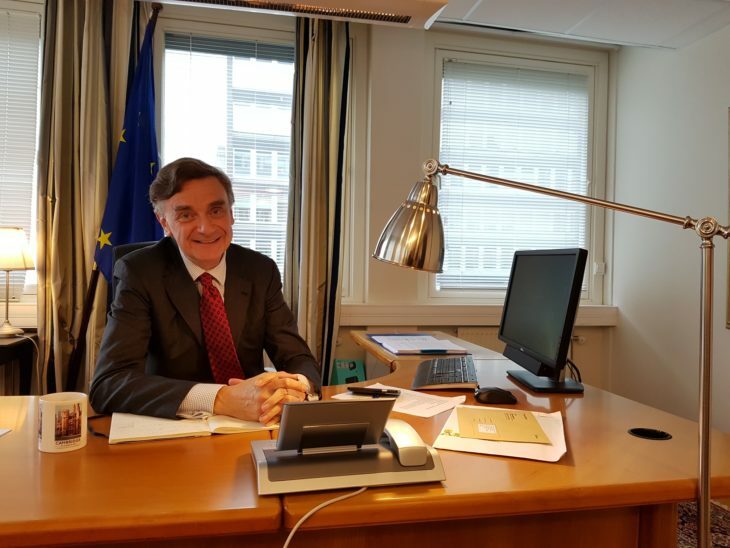 Tja til EU har intervjuet Thierry Béchet, EUs nye ambassadør til Norge. Vi utfordret ham på hvordan det er å være ambassadør i et land med økende politisk motstand mot EU. Mr. Ambassador, welcome to Norway! You have now lived in Norway for a short while – how do you like it so far? Thank you! My arrival here, by sea, and my first two months have been a delight. This is one of the most interesting positions for a European Union diplomat. The intensity of the relationship between Norway and the European Union is such that there is no choice but to jump at the deep end. I have met most of our main interlocutors in the first weeks. I have travelled around the country a few times already, and I must say this is a part of my job that I relish particularly. So, to answer your question, I like it a lot! How will you work in practice as the EU’s representative in Norway? On a personal level, what are your main goal, what do you wish to achieve during your tenure in Norway? Norway has a unique relationship with the European Union, and my mission here is to service that relationship so it can thrive. There are many actors, both in Norway and in the European Union, who have a stake in this relationship. The interaction between officials in Oslo and Brussels is intense. But it is not only about officials. The role of the Delegation is to represent the European Union also to the broader public, to civil society. I want to develop the direct contact with Norwegian society, beyond officialdom, beyond Oslo. I will use every opportunity to talk to as many people as possible, whether they agree with my message or not. I believe it is important to be able to answer questions from Norwegians in a straightforward way, without necessarily trying to change their minds. The European Union and Norway have a long and at times complicated relationship – how do you see future relations between Norway and the EU? On a political level, what will be the most important areas of shared interest and cooperation? I am not sure I agree with your assessment. I am not sure I agree with your assessment. Our relationship goes back a long time, yes. And it is a complex relationship because it encompasses a very large number of policies and issues. But it is also a very stable, predictable, mature relationship. The sovereign decision of Norway to have this kind of relationship is based on a rational assessment of its interests, and of the best way to protect and promote them. I see no reason for that to change. To the contrary, there is a common interest in protecting the system we have, starting with the EEA agreement. As to the most important areas, every sector of Norwegian society will legitimately see the relationship with the European Union in that particular sector as the most important. For me, they will all be the most important. How do you perceive that a large majority in both the population, and now for the first time also in Parliament, is opposed to membership in the EU? The question of Norway’s membership of the European Union is not on the table. It is up to the Norwegian people to decide on their posture regarding membership, and they have done so. This is the context in which we work together. We have a relationship of unique intensity, and a common interest in making it work to the benefit of all side. The question of Norway’s membership of the European Union is not on the table. The Labour Party is only the last of several political parties that publicly states we must start to (consider to) use the right to “veto” some EU legislation, which Norway is obliged to incorporate following the EEA Agreement. How will you and the EU deal with this increased political opposition and avoid such conflicts with the Norwegian government? Again, I am not sure I agree with your assessment. I don’t see an increased political opposition to incorporating legislation in Norwegian law. It has to be looked at on a case-by-case basis. A huge majority of the legislation relating to the four freedoms is incorporated by the Storting not only because of the EEA agreement says it should be, but also because incorporation makes sense from a Norwegian perspective. We have very comparable societies, political and economic systems, and we share the same values. When there are differences, they are taken into account, and if necessary, negotiations take place. The legislation approved by the European Union is usually a good balance between objectives and interests because each piece of legislation has been through a comprehensive process involving various actors with different interests before being formally adopted. This process is transparent and open to contributions by Norway. Yes, there is a backlog in the incorporation of legislation, and we need to work on that. In almost all cases this is due to the workload of those dealing with the process, and not to an opposition on the substance. In the rare cases where we have a disagreement on the substance, the system provides ways to deal with them, through dialogue and if necessary adaptation. The European External Action Service (EEAS) soon celebrates its 10 years anniversary. Has the EEAS been successful in incorporating a more coherent approach for the EU’s external relations and the member states’ foreign policies? 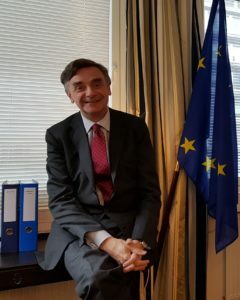 I certainly believe that the European Union foreign policy that has been put in place by the Treaty of Lisbon, including the creation of the European External Action Service, is a success. We see it every day. The European Union is seen across the world as a predictable and reliable partner. The European Union uses its power, hard and soft, and its resources to build resilient communities all over the world, in an approach based on values and long-term objectives, and in true partnership. We are aware of the geo-strategic games and when useful we can adapt to them. But our preferred option will always be to create win-win situations. The European Union approach has been coherent, over time and over the various issues. Of course, member States sometimes have different views on some of the elements of the policies. Member States have their perceptions, shaped by geography and history. Today these differences do not cause paralysis. We talk to each other, and in the end we implement policies that combine, rather than exclude, these perceptions. That gives us strength and credibility. Earlier this year, in January, we interviewed Mr. Michel Barnier, the EU Chief Negotiator for Brexit. Since then, a lot has happened in the negotiations between the UK and the EU. What is your perception of the ongoing negotiations? Negotiations are moving. There is a lot of work to be done. I do not want to speculate on what goes well and what is difficult. Michel Barnier has underlined that the sides work in a constructive spirit. What is important is that there is a common horizon: the willingness to reach an agreement on the withdrawal of the United Kingdom, an orderly withdrawal, and in due time, define the future relationship of the UK with the European Union. Brexit could potentially have major effects on Norway, both politically and economically. What is Norway’s role in, or rather on the side of, the EU’s Brexit negotiations? How will our voice be heard and interests taken into account? Norway is kept fully informed of all elements of the negotiations, as are the other EEA EFTA States (Iceland and Liechtenstein). We are fully aware of the importance of these negotiations for Norway and we act accordingly. The first trip outside European Union member States our negotiator Michel Barnier took after being appointed was to Oslo. Since then, he has had many contacts with Norwegian interlocutors, including a few days ago with Marit Bergen Rosland. Norway’s voice is heard loud and clear in Brussels, at all levels, political and technical, and Norway knows very well how to defend its interests effectively. How could Norway’s relationship with the EU be shaped/changed by Brexit? I see no reason to believe that the relationship between Norway and the European Union would be affected by the withdrawal of the United Kingdom. An overarching goal of the upcoming negotiations is to preserve the integrity of the Single Market. When we safeguard the internal market, we are at the same time safeguarding the EEA agreement. Given the commonality of interests in the EEA, I see no reason to believe that EEA countries would not be able to replicate what the European Union agrees with the United Kingdom in the relevant areas. I see no reason to believe that the relationship between Norway and the European Union would be affected by the withdrawal of the United Kingdom. Last and maybe the most important question: How far are you willing to go to integrate yourself in the Norwegian culture? Will you start actively with cross-country skiing? Eat regularly traditional food like Brunost and Smalahove? Thierry Béchet startet i Europakommisjonen i 1991 og jobbet med Midtøsten-spørsmål under den første Gulfkrigen. Han har jobbet i kabinettet til en rekke kommisærer og ledet EUs delegasjon i Jerusalem i årene rett etter Oslo-avtalen. I tillegg har han vært stasjonert i Genève og kommer nå fra stillingen som EUs ambassadør til OSSE i Wien. I tillegg til sitt arbeid for EU underviser Béchet ved College of Europe. Neste artikkel Europeisk forsvar uten Norge?